Julie B Booth: Another Printed Fabric Giveaway...Architecture! It's been a while since my last post and I have a bit of "housekeeping" to do. The Printed Fabric Bee is having another fabric giveaway. This month, Deborah Boschert was Queen Bee and her theme was Architecture...12"x 12" and all blues. Above are the 6" giveaway fabrics so far...many more to come...including mine! 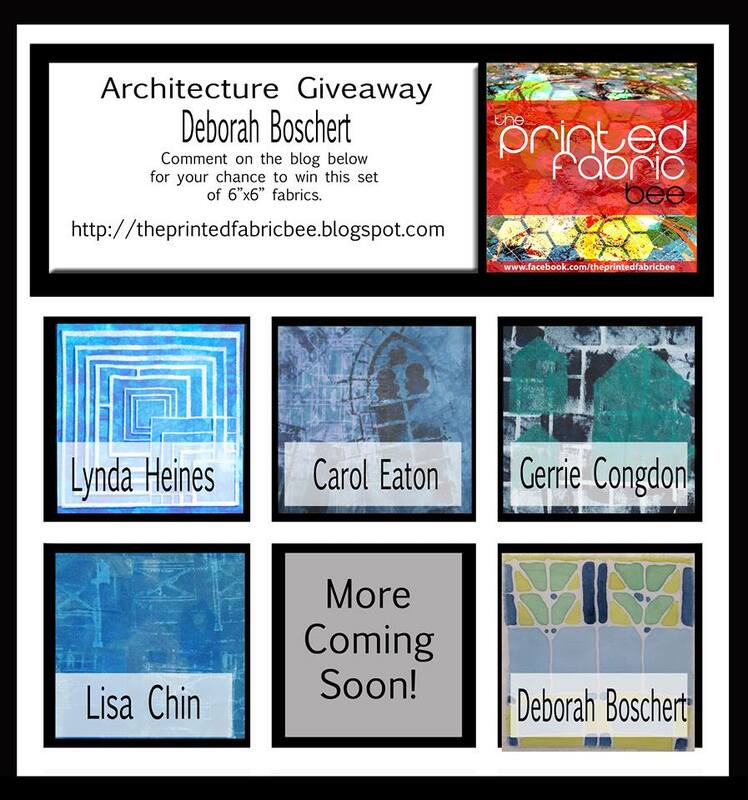 If you want to be eligible to win, be sure to leave a comment on either Deborah's blog or The Printed Fabric Bee blog. She'll be picking a winner on September 15th! I've been a busy bee myself...I'll be heading off to Cleveland, Ohio in a week and a half to tape two TV segments for Quilting Arts TV! I'm very excited....and a little bit nervous! What an honor to be asked! So...I've been spending many hours in the studio painting and printing fabric in preparation. A big box full of samples and supplies headed off to Cleveland yesterday. Today, was the first day of my Healing Cloth workshop...I'll be posting about it tomorrow...such promise so far! How exciting! You are off to a running start here in the beginning of fall...best of luck! Thanks so much, Mary Ann. Have been feeling a bit disconnected from the blogosphere...have to catch up with your posts and others too! Congratulations on filming for QA. We look forward to watching. Thanks Susan and Elizabeth! I'll be sure to let everyone know when the segments air on TV.